We now stock thousands of these Queens Jubilee Party Poppers to celebrate Queen Elizabeth II's 60 year reign. Emitting a loud bang with the string is pulled, what better way is there to make your customers be heard as such great times as these. Let your customer's be heard and stand out in the crowd with your personalised printed party poppers and gain huge Company branding exposure along the way! Customised along with the box lid - for good overall Corporate exposure. 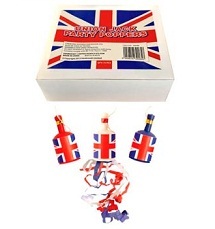 For a FREE QUOTE, please fill in the form regarding our Queens Jubilee Party Poppers and we'll be able to help you.